Turkey Hash, yeah, nothing says that the thanksgiving is over like a plate of eggs over easy, toast, and a helping of turkey hash. It’s a nice brunch item, and since it uses small sized pieces of turkey, you can make this from the left-over’s left-overs. Chop the vegetables and sauté them with a little butter in a skillet. When they are tender, add the turkey and the gravy. You can add a little water if the left over grave is a bit on the thick side. Sprinkle with salt and pepper to taste. I usually serve this on toast and top with an egg. Time to put that stock to use, that’s right; we’re talking turkey soup here. 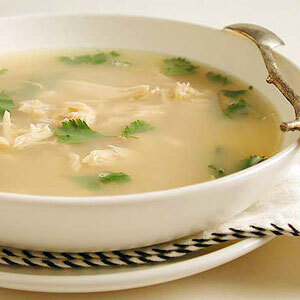 We’ll talk about turkey salad later, but as the colder air creeps in, and turkey soup is what’s on. Pour the stock into a soup pot on a medium heat and shake in a little sea salt. Then add the rice and let it simmer away for 20 minutes or so. Then add the carrots, celery, onion, turkey, thyme and let that simmer another 20 minutes or so to let the flavors meld together. At this point, you could toss in some cilantro if you have some handy, and I usually have some handy as its growing in the window sill. Let that cook another couple of minutes as you fetch some bowls and crackers. I prefer to use the wider, shallower soup bowls for this, and serve it with the crackers and leftover cranberry sauce (for the crackers of course). Its turkey time! And turkey is certainly a local Long Island item. The state’s department of conservation reports that the local populations have made a remarkable recovery since the wild species was threatened in the late ninetieth century. The wild turkey hunting season on Long Island is from November 21st through the 25th. But, if you don’t have the time or inclination to dress up like a pilgrim, grab a blunderbuss, and wander into the field to ‘shop local’ for a thanksgiving turkey, there are other local alternatives. Turkeys have been farmed on Long Island since colonial times. When I was a kid living in Patchogue, there was turkey farm on Gazzola drive, right near Sills road. They made quite a racket when you drove past. Although that farm, like many other local large farms is no longer around, there are still local Turkey farms on Long Island. So, here is another shop local option for your holiday feast. Unlike many of my other recipes, this list of ingredients harms no hogs! As for cooking the bird, my personal secret recipe will remain a secret… at least for another year. So, tomorrow, enjoy your secret turkey recipe but remember that the results are best shared with friends and family and a remembrance of those whom we are thankful for. 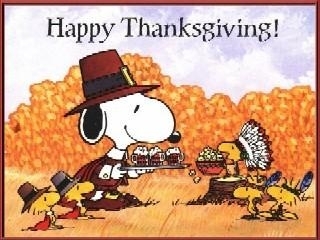 Happy Thanksgiving to all… and check back for more recipes after the holiday! So let’s talk stuffing. I’m a big fan of stuffing. I think it’s what really compliments the bird. 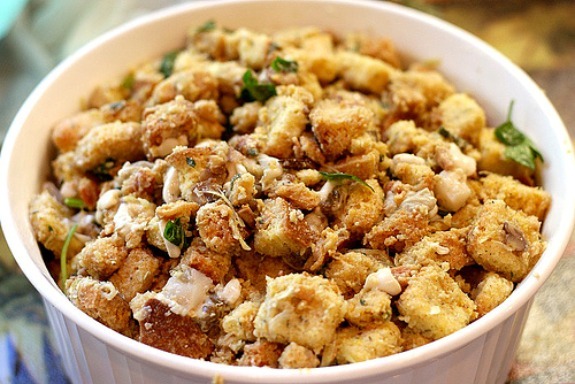 Now I know that there are a thousand and one mother’s recipes for stuffing, so feel free to share yours in the comments section. Stuffing… Long Island style… here’s what you’ll need to bring a taste of the coast home to your house. Start by rendering down the bacon, thick cut of course (you can use a good tbsp or two of duck fat instead of bacon here if you wanted to). Then, sauté the onion and celery until tender. Deglaze the pan with ¼ cup or so of the Duck Walk red wine, then add in the stock, the oyster juice (clam juice if you don’t have oyster), and the garni. Bring this mixture to a boil. Let’s talk side dish vegetables. With a ripening/harvesting date range of October through November, Long Island cauliflower is not only local, but freshly seasonal for this time of year. Now, cauliflower is most often seen on the table in a steamed or pureed form relatively unseasoned, and most people consider it rather bland. But anything would be bland if you put no effort into it. If like many people, you steam cauliflower florets too long, letting their natural flavor dissipate, the resulting dish will be bland. But, we will infuse our cauliflower with so much flavor that it will stand up nicely next to the main dish it accompanies. We will be roasting our cauliflower… sounds dangerous? Read on! As there is likely to be a large bird in your oven, cut cauliflower into florets and put in a single layer in a shallow baking tray. Toss in the garlic. 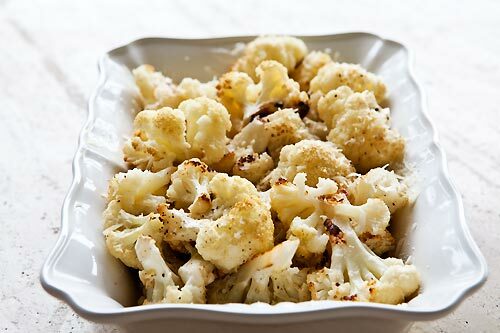 Sprinkle lemon juice over cauliflower and drizzle each piece with olive oil. Sprinkle with salt and pepper. Place the tray in the oven. Let this roast in the oven for about 25-30 minutes, or until the top is lightly brown. Test with a fork for desired doneness. Fork tines should be able to easily pierce the cauliflower. Remove from oven and transfer to a warm casserole dish. Sprinkle generously with Parmesan cheese. Serve immediately, or cover and leave in warm oven till its time to take it to the table.